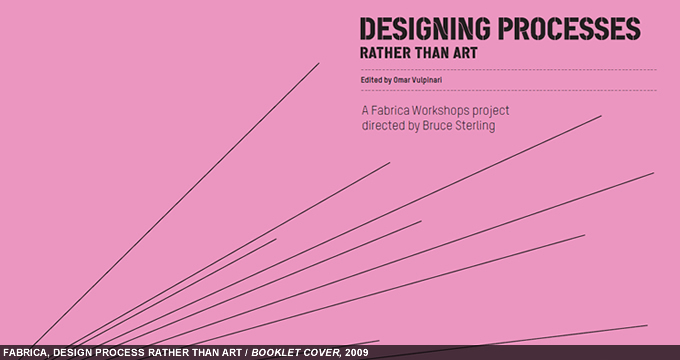 Fabrica is an educational institution, research workshop and studio. Fabrica pursues research through making, producing groundbreaking projects in collaboration with the world’s best creative talents. Fabrica’s desire is to positively impact upon social and cultural change. Fabrica pursues its own projects as well as working for others, from commercial clients to governments, NGOs and the cultural sector, developing tangible research, expertly communicated. The Bruce Sterling workshop theme took its cue from the concept of generative art, i.e. a process which develops with a certain degree of autonomy to produce a work of art or design. When generative art is computer-based, windows are opened onto otherwise unimaginable fields of human creativity.The computer becomes a vehicle for exploring new territories and boosting our understanding of creativity as an inseparable synthesis of art and science. Benetton’s communication research centre, hosted on 25-28 November 2008, a workshop held by futurologist and author Bruce Sterling, one of the founders and leading promulgators of cyberpunk sci-fi. Modern ecology began with Charles Darwin’s studies; in his “theory of evolution”, published in 1859 in On the Origin of Species, he underlined the adaptation of the different organisms to the various kinds of environment, which are subjected to the age-long examination of natural selection. However, the word was coined by Ernst Heinrich Haeckel in 1869 and comes from the Greek óikos meaning “house” and logos meaning “discourse”: it is therefore a biological science that studies environment and the relationships that the different living organisms establish between each other and with the environment itself. For some time, Haeckel was a strong supporter and popularizer of Darwin’s theories, but he soon became one of his most bitter enemies; he firmly refuted the process of natural selection as the basis of the evolutionary mechanism, in favour of a thought that was more focused on the environment as a direct agent on natural organisms, which is able to produce new species and generate diversity. Ernst Heinrich Haeckel’s thought and work represent the starting point of this critical reflection: first of all, because it was the theoretical and practical cue suggested by Bruce Sterling during his workshop for Fabrica, to which the text refers; secondly, because it allows me a philosophical and critical reflection aspiring to find a possible point of contact between nature, theories of evolution and programmatic and generative art. Is it impossible? Well, I would say no, on the contrary. Above all if we try to compare and amalgamate, like the colours on a canvas, the German biologist’s research on one side with some works of conceptual and minimalist artist Sol Le Witt and the possible relationship between mathematics and nature on the other, and what is known today as art and generative design. “Kunstformen der Natur” literally means “artistic forms of nature”: this is the title of biologist Ernst Haeckel’s 1898 most important text, his most complex and fascinating research. Moreover, this is the text from which Bruce Sterling took, for those participating in his workshop, some primary images that could be the graphic material and starting point for an aesthetic and methodological reflection on the practices of generative repetitiveness. By watching the richly decorated plates in Haeckel’s text, it is undeniable that nature is able not only to create spontaneously real “art forms”, but also to produce a direct correspondence between a certain generative aesthetics, starting from a fundamental unit/nucleus to come to a complex entity, and a consequent adaptive and evolutionary practice. In other words, if the stages of the embryological development of a species actually trace the evolution phases that led it to its position in the natural order, the survival of each species basically depends on its interaction with the environment. According to Haeckel, the mechanism thanks to which new species and a new diversity have origin is that of a gradual addition of a certain development trajectory starting from an initial unit, which is determined by imposed external (environmental) parameters, which are able to influence the gradual direction of the trajectory itself. As everybody knows, US conceptual and minimalist artist Sol Le Witt, who died not long ago, is one of the spiritual fathers of modern artists and generative designers. By reducing art to a series of instructions thanks to which everybody is able to draw forms, colours and lines in the two-dimensional and three-dimensional space, creating geometric elements that are repeated and modulated according to standard space proportions, Le Witt loved reminding that “all the people are able to participate in the creative process, to become artists themselves”. It is well-known that the artist tended to separate the planning stage from the realization of the work; he devoted himself to the former, whereas his assistants devoted themselves to the latter: if the artistic process thus lies in the conceptual planning of the work, the (basic, elementary and geometric) execution can be carried out by everybody, thanks to a series of detailed instructions that are suggested by a thinking unit with a procedural approach. He also claimed: “There are several ways of constructing a work of art. One is by making decisions at each step, another by making a system to make decisions.” In this kind of approach the work of the last years of some of the most important generative artists and designers in the world (Casey Reas, Ben Fry, Jared Tarbell, Theodore Watson, Lia, Toxi, Andreas Schlegel, Marius Watz, Robert Hodgin, to mention only some of them) is reflected: if the human being identifies himself/herself with the author of a series of mathematical instructions that can be suggested to a computer, the resulting work of art will be the sum of the operations that the computer has carried out autonomously. Well, I do not know what these things suggest to you: I think that also in this case we can make a comparison with the natural universe. If we assimilate the environment, nature in its widest meaning, as the entity that is able to cause a series of changes, evolutions and dynamics, then the organisms living in contact with it (again, the concept of “ecology”) are able to interpret these vital codes, to assimilate them, in order to react to them and autonomously generate a series of forms, colours and systems that can be seen as the result of their evolutionary process, which comes to a complex final system from a starting unit. The difference maybe lies in the “spontaneity” with which this process begins: if an artist/designer decides, in advance, a series of instructions that will be given to the computer, it is difficult not to think that nature operates by following only its evolutionary spontaneity. At the same time, it is fascinating even to think that as the artist/designer does not know the final effects of the instructions, giving the computer the freedom to interpret them, similarly nature does not care about the effects it produces on the organisms living in it, giving them evolutionary freedom of forms and elements that we, human beings, only afterwards could maybe consider as “works of art”. Today, one of the most fascinating mathematical theories is undoubtedly that of fractals: according to the definition of their discoverer, Polish mathematician Benoît Mandelbrot, they are geometric shapes, characterised by the endless repetition of the same pattern at ever smaller scales. This is the most intuitive definition that can be given to shapes that exist in nature in an impressive number but do not still have a precise mathematical definition. The natural universe is rich in forms that are very similar to fractals, forms that do not follow the norms of the Euclidean geometry: a stretch of coast, the branches or the roots of a tree, a cloud, the snowflakes, the ramifications of a lightning and the dentation of a leaf are example of fractal forms originating spontaneously in nature. Among these, the fractal form par excellence is the spiral, the constituent element of the shell of many annelids and conches, which is one of the main objects of study of Ernst Heinrich Haeckel’s theories and one of the most beautiful and fascinating geometric forms. If we shift the field of analysis to mathematics, to numbers, to equations and algorithms, the level of intersection between science, technology, art and nature does not change. And if the procedural and generative method is that we have chosen as the guiding element of this treatise, it is not surprising to think that the construction of fractals follows a reiterated process, that is, the repetition of a starting element for a theoretically infinite number of times until, after a while, the human eye cannot distinguish the changes in the starting element any longer. We must not forget the fact that, as it is acknowledged, fractals are influenced by certain controlled casualness. There is thus again the element of casualness, of spontaneity, as the distinctive (or unifying) element between computer and nature, according to which evolutionary mechanisms cannot be predicted from their constituent elements and it is often impossible to reconstruct them, starting from their visible manifestations. At this point of the text, the procedural, generative, iterative and evolutionary element may be considered as the pillar of the thought underpinning a modern “computational ecology”: between Turing’s revolutionary theories on “morphogenesis” (every living organism is able to develop complex bodies, starting from extremely simple elements and basing on processes of self-assembly, without the aid of a guide following a prearranged plan) and the most recent studies that have been carried out on “genetic algorithms” (a particular class of evolutionary algorithms using techniques of mutation, selection and recombination, so that a certain population of abstract representations of possible solutions to an optimization problem evolves into better solutions) almost 50 years of studies, analyses and research passed; they aimed at underlining the nearly computational properties of Mother Nature on one side, and the ability of digital machines to simulate and repeat complex natural phenomena. I think that what is interesting in Genetic Images is the fact that this work was presented as an interactive installation: in other words, it was the public who could choose and select the most interesting images and forms from an aesthetic point of view, among those generated by a computer simulating a process of artificial evolution. The selected images were then recombined by the computer to create new ones, basing on alteration and mutation methods, similar to those of natural species during their evolutionary process. Karl Sims thus wonders whether these interactive evolutions can be considered a creative process. If yes, is it the public who develop an independent creative attitude or is the presence of a designer making the computer follow precise creative paths necessary? Or is it maybe the computer that develops autonomous creative tendencies? In his treatise, Sims duly mentions biologist Richard Dawkins who, in his book The Blind Watchmaker, talks about the ability of natural evolutionary processes to create complex forms without the external presence of any designer or programmer: “It is thus possible that these generative techniques challenge an important aspect of our anthropocentric tendencies, according to which it is difficult for us to believe that we are planned not by a God but by casualness showing through the codes of a natural evolution”, concludes Sims. Maybe true art lies exactly in all these things.